Rutgers scientists have developed catalysts that can convert carbon dioxide—the main cause of global warming—into plastics, fabrics, resins and other products. 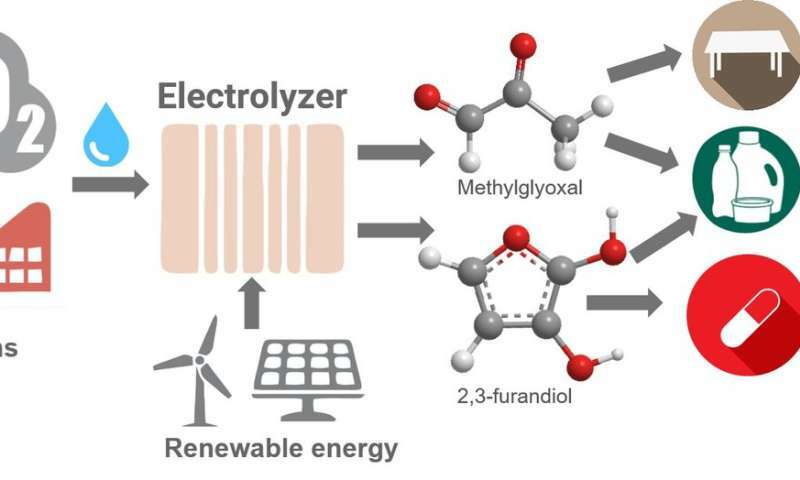 The electrocatalysts are the first materials, aside from enzymes, that can turn carbon dioxide and water into carbon building blocks containing one, two, three or four carbon atoms with more than 99 percent efficiency. Two of the products created by the researchers—methylglyoxal (C3) and 2,3-furandiol (C4)—can be used as precursors for plastics, adhesives and pharmaceuticals. Toxic formaldehyde could be replaced by methylglyoxal, which is safer.